The USB-910H Embedded Systems Interface provides connectivity between a host PC and I2C, SMBus, or SPI. Other interfaces can be supported by "bit-banging" the 9 general-purpose I/O. 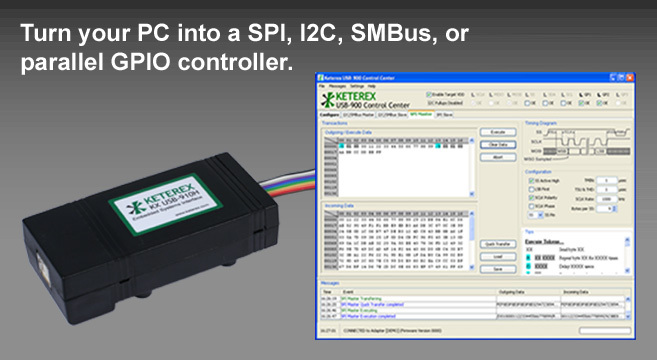 USB transactions are generated on the host PC using either the Keterex USB-900 Control Center application or custom software via calls to the provided API. The USB-910H Adapter converts these transactions to I2C, SMBus, SPI, or general-purpose I/O operations. Built-in scripting accommodates complex bus protocols, including forcing and/or detecting general-purpose I/O changes during operations. The USB-910H Adapter provides configurable I/O voltage levels from 1.65V to 5V. In addition to setting the drive and sense logic levels, this voltage can be connected to the target hardware, providing up to 400mA to the target device. Visit the Technical Support Center.